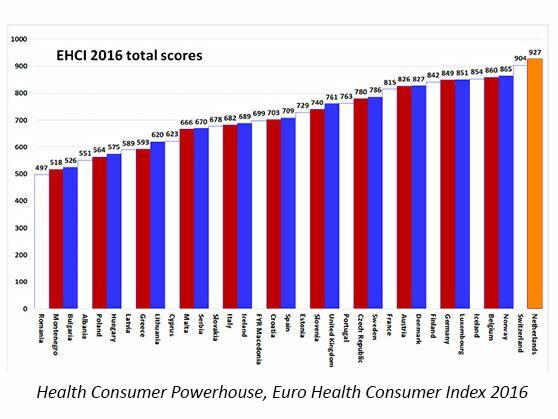 The Netherlands have the best functioning healthcare system, according to the Euro Health Consumer Index. In the Index, that is published yearly by the Health Powerhouse the Netherlands scored a 9,3 out of 10. The index compares the healthcare systems on 48 indicators, divided on 6 sub-disciplines: patient rights and information, accessibility (waiting times for treatment), outcomes, range and reach of services provided, prevention and pharmaceuticals. The Netherlands score high on all disciplines, with higher grades than 2015. In each country the amount of money that was spent on care and the outcomes on that was also evaluated. The Netherlands on this scored on place 11. To improve this, the Netherlands can learn from Macedonia, who score best on this Bang-for-the-Buck list. In total the healthcare in Europe has improved, with higher survival rates of heart disease, stroke and cancer and lower infant mortality rate. For more information, Download the full report of the EHCI here.